You may have heard of the Australian Fairy Tale Society. You may even be a member – if so, you know how amazing this group of people are. If neither of the following apply to you, then you’re in for a treat. The society is an incredible mix of academics, artists, storytellers, musicians, writers and fairy tale lovers; a full spectrum of knowledge and enthusiasm that makes for a magical mix. In a few weeks the AFTS are holding their annual conference, this year in Melbourne at the Glen Era Town Hall, on Saturday June 24th. If you’re remotely interested in Fairy Tales and their influence on our history and culture (and vice versa! ), or art, or storytelling, or literature, then this is the where you need to be! 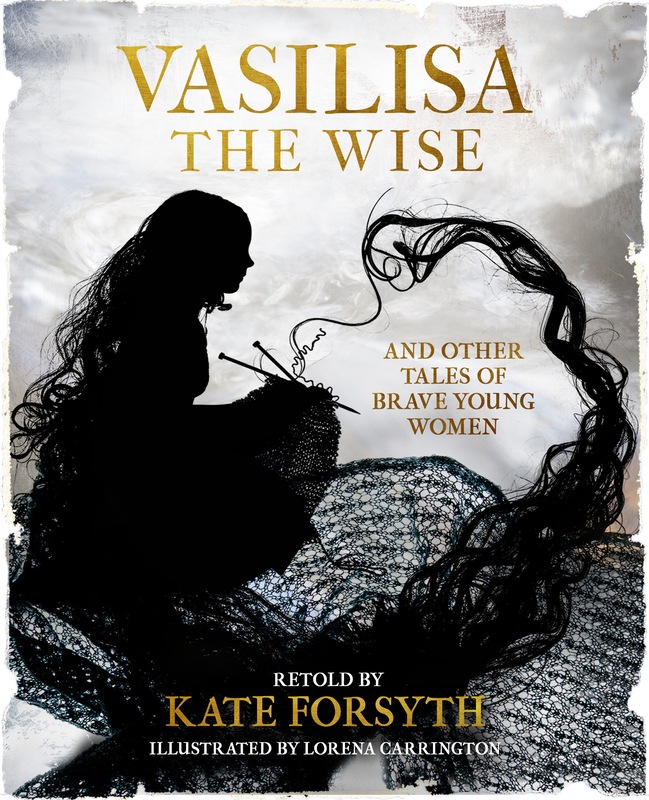 I’ll be up on stage talking about my creative process and previewing new illustrations from the upcoming book Vasilisa The Wise, and selling prints too, including a very limited edition (for now) of a print that won’t otherwise be released until the book is! It’s one of my very favourite illustrations from the Vasilisa, and one that only a few people have seen. Thankfully I’m up fairly early, so I can listen to the wonderful array of presentations without breathing into a paper bag. Just look at that fantastic line-up! I hope to see you there! In addition to the yearly conference, the AFTS produce a bi-monthly ezine, which truly is a wonder to behold. The current issue on Sleeping Beauty comes in at a whopping 60 pages! It includes a round table discussion with Rebecca-Anne Do Rozario, Kate Forsyth & Belinda Calderone; short stories; performance scripts; an interview and sneak preview of Kate Forsyth’s upcoming book Beauty in Thorns; artwork by Kathleen Jennings, Spike Dean and Erin-Claire Barrow; and so much more. To get your copy become a member of the AFTS here. It will cost you a mere $25 a year. A true bargain, considering the incredible online magazine, opportunities for meet-ups and gatherings, the yearly conference, and the experience of being welcomed into a group of wonderful new friends. Go on, head over and sign up. In fact if you become a member after reading this, let me know and I’ll mail you one of my artwork postcards with a little enthusiastic note about your incredibly wise and clever decision! I think the second last time I was on the verge of tears in the supermarket probably involved two young children, a full shopping trolley, a long checkout line, and a packet of fruit tingles. The last time was two days ago. Trying to decide between lentils and kidney beans, I looked down at my phone, probably to skip to the next podcast, and noticed an email from the wonderful Monique at Serenity Press. And opening it up, I found something that made my knees go weak and my eyes blur. I needed a moment, and I just hope not too many people thought I was welling up at the very moving array of canned legumes. There’s something about a cover that makes it all the more real. I know this book is going to exist. I’ve finished the illustrations and Kate and Monique are working on the last edits for the text. The book train is moving as it should. But seeing our cover and thinking of it lying on bedside tables, tucked snugly into bookshelves, held and creased by (hopefully) many hands…. gives me a thrill every time I think of it. And every time I think of it, I open my phone and sneak another look. And now I can show it to you! Isn’t it lovely? Hello! I’m still here, squirrelling away. I finished the illustrations for Vasilisa at the end of March (and excitingly, you can spot it on the Serenity Press ‘Coming Soon‘ page! ), and have been busy with other things: mostly lots of work for clients, but also working on a long interview for a lit journal and writing a conference paper. Which has been great, but it means I hadn’t made an image just for myself in nearly two months. So when I spotted the #mermay hashtag on Twitter, I knew it was time to crank up Photoshop again. So, as a bit of an apology for being away for so long, here are some sisterly mermaids. I was thrilled to have been commissioned by Writers Victoria to contribute a feature article and a front cover image for their April/May issue. The issue’s theme is around Writing for Young Adults, and I contributed a piece on adolescent transformation in fairy tales. I’m in excellent company, and look forward to settling down in front the fire with a cup of tea to read them all. Hello to those who made it here from the pages of The Victorian Writer. For those new to my work, I have a (new) website at lorenacarrington.com and also tweet from @lorena_c. Opening up your house to strangers is often a fraught and invasive enterprise. It usually means you’re trying to sell it or, if you’re renting, someone else is selling it out from underneath you. Or the estate agent is inspecting it and, if you’ve kept it nice enough, they’ll let you stay. In our case, it’s a celebration of Art and the work we’ve made over the course of a year. We transform our living space into a gallery and open it up to the public every March. It’s a fine line between clearing as much out as we can, and keeping it liveable for the times between. This year, we were open last long weekend, and this one, for Arts Open Castlemaine. We scrub the windows, throw art up on the walls, and optimistically buy lots of red dot sale stickers because we always lose the pack we bought last year in the intervening 11 and a half months. Despite the occasional bought of nerves, and all the extra cleaning, it’s wonderful. People are lovely and chatty, and ask great questions, and often lead me to new ideas, just by talking about the work. They see a different angle to something that I hadn’t considered, or are affected by different ideas in an image or story. Some respond to something from their childhood, or to the single mother in a story, and some just want to know the technical details. Whatever it is, there’s something about talking about the same thing over and over again to different people over several days that brings out new ideas to me as well: new work I want to make, or a different way of seeing an image I created and know right down to each leaf and twig. Even if we don’t make as many sales as hoped (there are always some, but I never seem to end the week rolling around in a mountain of cash, tossing banknotes around like autumn leaves; gold coins tinkling around me like rain, and that seems most unfair) it’s an invaluable way to make new contacts, generate ideas, and absorb some of the enthusiasm that people bring with them. Always, the positives outweigh the odd negative. Of course we do get the odd close-talker, looooong-talker, left-of-field theorist or self-promoter. And there always, always seems to be one who is a combination of all of the above. Last week one man claimed something so wacky, and frankly racist, that I was very happy to show him the door. And there was the woman who walked in, cast a cool glance around, said “No, this isn’t what I want to see,” and swept out again. But I treasure these moments too, for they give me good drinking stories. This year I am exhibiting work with my mum (Hooray!) Jenny Carrington, an incredible artist, book crafter and weaver, amongst many things. Style-wise, she comes from a ‘hard-edge’ background, but her connection to the landscape that is often her subject makes her work anything but hard. It’s imbued with symbolism, spirit and her deep love for the Australian bush. Her woodblock prints are uncomplicated, but they’re far from simple. And her pen drawing are full of so much detail, even her perfect shading is accomplished with thousands of perfectly placed pen-marks. Arts Open is a great chance to visit artist’s studios and see how they work. Castlemaine is an incredible hub of artists: Photographers, painters, sculptors, printmakers, jewellers… You name it, someone here makes it. So if you’re in Castlemaine this weekend (March 19th & 20th) please do come visit. Our door is open!